Thanks for indulging me and sympathizing with my whiny post, I think I'm over it now and moving on with the spirit of giving. 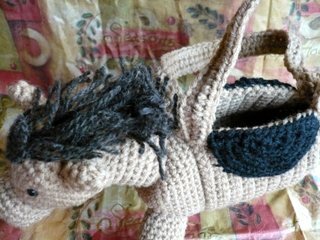 A little girl needed a hat, so I knit her a wool one with earflaps. But, knowing she had two siblings, I just couldn't send a package without including a little something for them, so I crocheted a horse purse for Emma and a knit up a princess crown for Mary. Hope they like everything, and that Elizabeth has very warm ears all winter long. In an email, another friend mentioned her lack of an advent calender this year, and I wanted to give her a little pick-me-up since 2007 has been pretty tough on her. 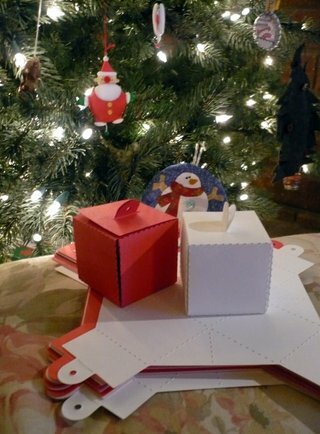 So I mailed off a set of 24 plain white die-cut boxes that she can decorate, fill and hang. I also sent her these because I can't wear them myself, and she deserves them. Always making socks for others, now she has her own pair. Not for feet, but oh well! 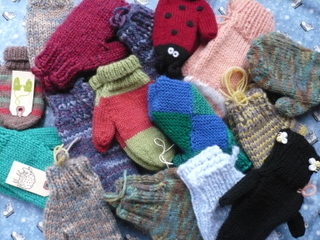 And finally, here's my box of mittens for Lynne and her project. No, I didn't knit all sixteen pairs myself, a few incredible people from my knitting guild pitched in and together, we filled a box that I'll be mailing off tomorrow morning. I feel better, and now it's beginning to look - and feel - a lot like Christmas. That's great that people pitched in on the mittens! They're all so cute. Your projects look terrific! 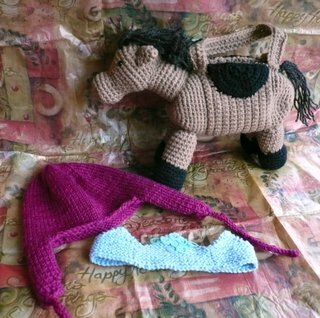 The Horse purse is adorable. I'm sure the child receiving it will love it. Is it your own pattern? What a blessing you are! oh my gosh, the horse purse is adorable! is that an original pattern? That is such a cute purse. so adorable. There is going to be one lucky kid out there!! That is a wonderful and very thoughtful Christmas package. And, the mittens too...great job getting those together to send out. I see your little ladybugs in there I think! And, the boxes were a great pick me up for a truly long downer of a year...the earrings too...since I now have a pair of socks all for me. LOL.